Twitter is one of the most famous social networking website. With twitter iOS device user have a great variety of options to pick from. Well if you are one of those people who are both an iPhone owner and a Twitter fanatic, but for one reason or the other you don’t like the official app, then you should try using these Twitter alternative clients. You may also like this : Twitter tools, Coolest Free iphone apps, alternative iphone browsers apps, Time saving iphone apps. This Twitter client has over 200 different features like theming, advanced searching, finding nearby tweets, friend list, drafting and offline tweeting, multiple account support, ability to upload to WordPress and Posterous etc. It has a very simple and clean interface. 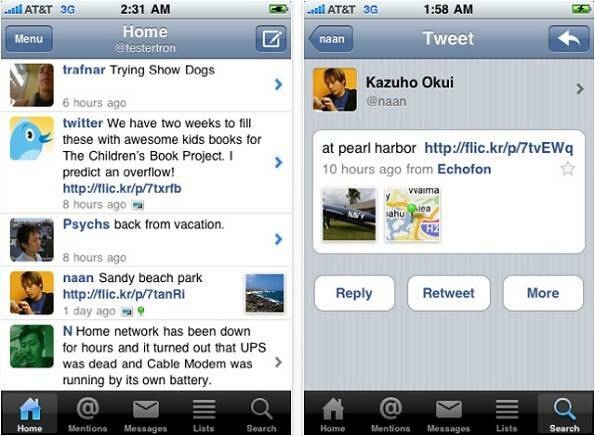 If you are a power tweeter, then Twittelator Pro is for you! 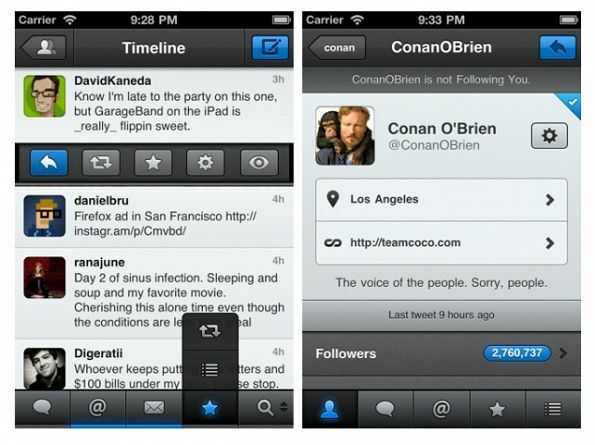 It is a Twitter client with a lot of features with a simple and clean interface. It also has support for push notifications. Push notifications are shown when you get an @mention, direct message, reply or when you have a new a follower. One of the best features of Echofon is that it lets you mute users, clients and hashtags. This app works on both iPhone and iPad. This app has ads but they will be removed if you upgrade to the pro version. Twitterrific was the first ever Twitter client that was released in the App Store, but the question is that does it still have that magic? There was a time when the developers packed this app with a lot of features, which made it extemely complex. But the developers removed all the unnecessary features and made it very handy with amazingly clean user interface. It still has all the useful features like tweet translator, timeline filters for tweets and supports URL shortening. If you upgrade it to pro you get to manage multiple accounts. Like both Facebook and Twitter? Then I have a feeling you will love TweetDeck. This nice Twitter client allows you to update both your Facebook and Twitter accounts straight from this app. It lets you update your timeline, post to multiple accounts, geo-tag tweets, create groups, share files and almost everything which you can do on Twitter while using a desktop computer. This iOS app can be synchronized with the desktop version too. According to its developer: “Tweetbot is a full-featured iPhone (and iPod touch) Twitter client with a lot of personality.” Well this great Twitter client has a neat interface and has a lot of features like multiple timelines, smart gestures, customizable navigation, push notifications through Boxcar, drafting, list management etc. Tweetbot is a great app for all the basic stuff. This app has a very clean interface and boasts a lot of features. Considering that it is a FREE app, it does have loads of features like multiple accounts (up to16 in the Pro version), theming, geo-tagging tweets, advanced nearby tweet searching and push notifications etc. 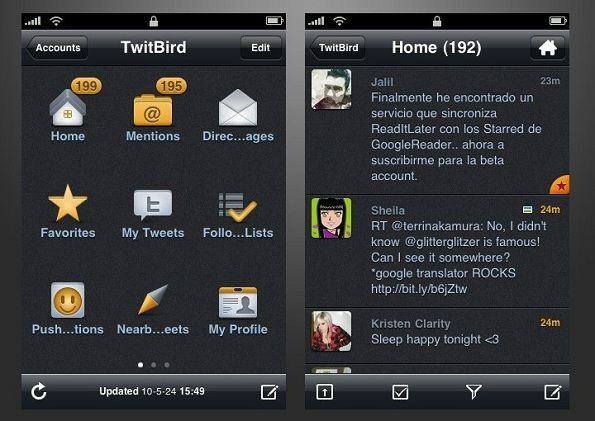 Twitbird is available in three types: Free (ad-supported, maximum of 2 accounts), Premium (no ads, maximum of 2 accounts) and Pro (ad-free, maximum of 16 accounts). Osfoora has a neat and clean interface with numerous features. If you want flexibility, then Osfoora is the best out there. It boasts features like multiple account support, tweet manager, Twitlonger support, draft manager, Geo-tagging tweets, tweet translator, advanced searching and URL shortener support etc. On the whole, it is an amazing Twitter app. TweetList stands out from the rest of the Twitter clients out there because it lets you view and quickly between your Twitter lists. The interface of this app is really neat. Its features include VoiceOver accessibility, Push notifications through Boxcar, full conversation view, Twitlonger support, multiple account support, ReadItLater, Instapaper and Mobilizer support etc. 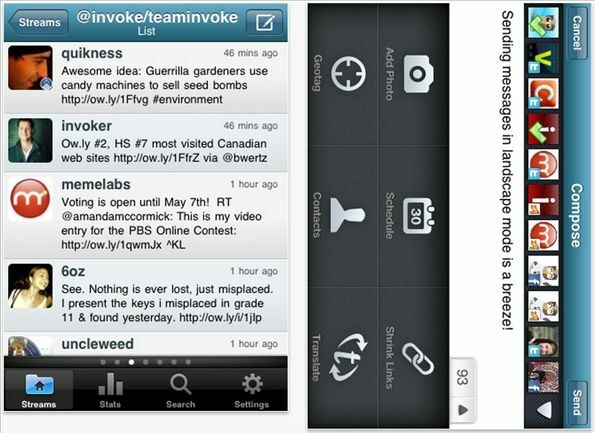 Hootsuite is a free Twitter app that lets you send Facebook and Foursquare updates. It is quite good if you want to manage your different social networking accounts. It allows users to switch lists and feed types with ease. It is one of the BEST free Twitter clients. Tweetings is a Twitter client that is very neat and clean, with a simple interface. It also has some good features too. It also allows you to use an advanced search feature that helps you find out who is trending or who is nearby. Some other good features are mute function, push notifications support, inline photo viewing, search timeline, GeoLocation support, tweet scheduler, TwitLonger and Twtmore support etc. Why? Why I should use all of these tools? I only need ONE Twitter App, not TEN!! !